Breakeven. This is when the energy generated by fusion equals the energy put in to maintain the plasma at thermonuclear temperatures. Ignition. This means that the fusion reaction is self-sustaining due to the action of the helium nuclei produced. Technological feasibility. This is reached when the net output of the whole plant is positive. So, in the future fusion reactor, the reaction has to be self-sustaining. In other words, we suppose that the alpha particles trapped in the plasma volume release their energy to the plasma so that it remains heated after initial heating by external means. In the meantime, the neutrons transport their energy to the reactor blanket, generating tritium and transforming the energy into heat, which can then be used to produce electric energy. Neutrons, which carry about 80% of the energy produced, leave the plasma without any significant interaction. They are absorbed by the lithium blanket placed around the reactor core and are used to regenerate tritium. 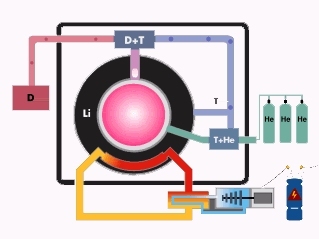 The lithium blanket has to be thick enough (about 1 cm) to absorb the fusion neutrons (14-MeV neutrons), which are then used to heat a liquid and generate electric energy through a heat exchanger. The heavier helium nuclei remain trapped in the plasma to which they transfer their energy, thereby obtaining a self-sustaining reaction without needing any further external heating. 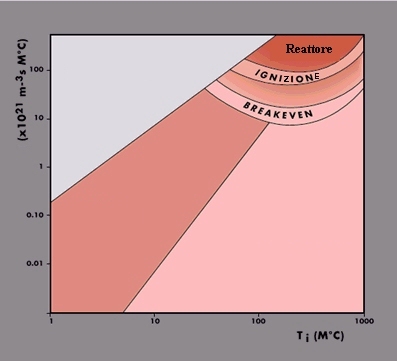 This is the outline of the future thermonuclear reactor, in which the energy released in the reaction (energy per unit time) will be proportional to the density of the reacting nuclei, to the probability that the reaction will take place and to the temperature of the plasma.